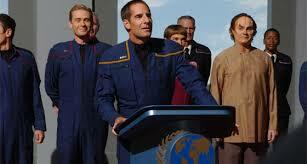 It’s been ten years since the final two first-run episodes of Star Trek: Enterprise aired. The prequel to the Star Trek phenomena was derided by many for its bland and derivative nature. 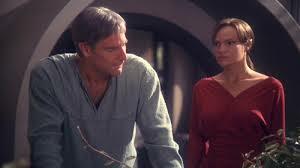 But a careful and objective look reveals that Star Trek: Enterprise had many terrific episodes, especially its later episodes. These are the best episodes of the fifth and (to date) final Star Trek TV show. 10. “Broken Bow” The pilot episode of the series (which at the time was simply called Enterprise) introduces the crew of the Earth starship Enterprise, including Captain Jonathan Archer (Scott Bakula), as they embark on an impromptu mission to establish relations with the infamous Klingon Empire. 9. “Affliction”/”Divergence” This two-part fourth-season episode answers the nagging question that has perplexed Star Trek fans ever since the late ’70s –why do the Klingons from the original series look different from modern incarnations of the warrior race? The answer was quite inventive. 8. “The Expanse” The second-season finale introduces a radical shift in the show’s direction and has echoes of the then-recent 9/11 attack. A surprise assault on Earth by an alien race called the Xindi leads to the Enterprise being re-assigned to undertake a military mission to Xindi territory to prevent another more devastating attack that is coming within a year. 7. “Zero Hour” The Xindi super weapon commandeered by an ill-tempered Xindi faction finally arrives at Earth in this thrilling third-season finale. The only hope to prevent Earth’s destruction is a desperate Archer and his crew, along with Xindi allies. The final moments were tense beyond belief and featured slam-bam space battles and the episode’s cliffhanger was way out of left field. 6. “The Forgotten” The personal ramifications and loss from the Xindi attack on Earth are seen through the eyes of Chief Engineer Charles Tucker (Connor Trinneer) whose sister was lost in the attack. Trinneer’s acting was quite memorable in the moments when his character broke down over his intense grief. Other standout acting came from T’Pol (Jolene Blalock) and Degra (Randy Oglesby), an Oppenheimer-like Xindi who has a change of heart about his race’s destructive plans for Earth. 5. “Twilight” An accident leaves Archer with the inability to form new memories. 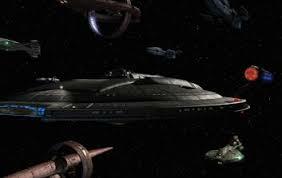 As time passes, the Xindi destroy Earth and humanity is scattered. As years pass by, Doctor Phlox (John Billingsley) discovers that curing Archer’s condition is the key to undoing the past. But will Archer be cured before the Xindi eradicate the last vestiges of humanity? From the shocking cold opener where a visibly older Archer witnesses Earth’s destruction to its final, nerve-wracking scenes, “Twilight” excelled in presenting us with a dismal future where the Xindi succeed and put humanity on the brink of extinction. 4. “United” This episode was actually the middle part of a three-episode arc where Romulans try to instigate war between Earth, Vulcan, Andorians, and other planets. 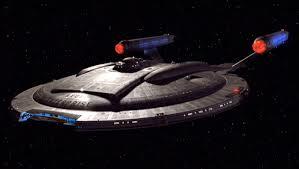 As a prototype Romulan ship with the capability to alter its outer appearance attacks different alien ships, the Enterprise crew and alien allies try to discern what is actually happening before war breaks out. 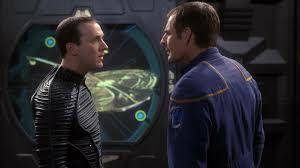 The alliance formed from the effort was one of Star Trek: Enterprise’s best moments and this episode used its prequel status to its best advantage. The highlight of “United” was a lingering shot featuring an armada of Earth, Vulcan, Andorian and Tellarite spaceships after confronting the Romulan menace. 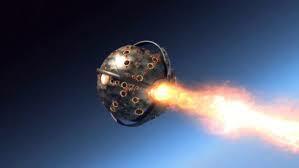 Thus, the seeding of the eventual United Federation of Planets has begun. 3. “Azati Prime” Archer and the Enterprise finally reach the Xindi super weapon in the aliens’ territory and prepare to destroy it, but Archer is suddenly whisked into the far future by the enigmatic time traveler Daniels (Matt Winston). As this goes on, the Xindi discover the Enterprise and launch a devastating assault that ends in a nail-biting cliffhanger. What made this episode stand out is the revelation that what Archer does has a pivotal impact in Star Trek’s distant future. 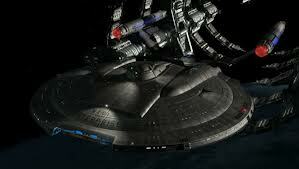 Plus, a hint of a future Enterprise is shown for good measure. 2. “Demons”/”Terra Prime” As Earth and its allies begin its first steps to forming the basis for what will become the revered Federation, those plans are threatened with the emergence of a xenophobic human terrorist group that wants to keep Earth and humanity isolated. Even though “These are the Voyages” was the official final episode of Star Trek: Enterprise, this penultimate two-part story is a much more valid conclusion to the series. That is because it points the way towards Star Trek’s optimistic future and illustrates quite nicely how the characters help pave the way for what lies ahead with Star Trek. 1. “In a Mirror Darkly, Parts I & II” Starting with a cold opener where humanity’s first contact with Vulcan takes a more savage turn, and then showcasing a dark, militaristic opening credits fans were in for a treat as the cast chewed lines and reveled in playing evil versions of their characters. Amidst the histrionics, questions about the original Star Trek episode “The Tholian Web” were answered and we learned the origins of the brutal Terran Empire seen in other Star Trek shows. “In a Mirror Darkly” was a true treat for fans with its numerous shenanigans and shout outs to the Star Trek mythos. Strange as it seems, the best episode of Star Trek: Enterprise doesn’t even feature the main cast. Rather this two-part story is solely about the Mirror, Mirror parallel universe versions of the Enterprise crew. It was easy to tell the cast had a great time portraying twisted, malevolent versions of their normal characters and that added to the joy of seeing “In a Mirror Darkly”. This fourth-season episode best shows the strengths of Star Trek: Enterprise when it fully realized its potential by being an actual prequel rather than recycling old storylines from other Star Trek shows. Sadly, the improvements the show underwent came too late since it was cancelled at the end of its fourth season. As lamentable as that was, at least Star Trek: Enterprise has a distinctive honor that other Star Trek shows lack: it ended on a creative high note. I’m really fond of Season 3 and 4, they really turned things around. Also I love Shran, what a great frenemy to have. Shran was so cool, it’s too bad they canceled the show just as it was getting great!